On this episode of SOB (Style of Business), Keetria interviews Charlynda Scales, the CEO of Mutt’s Sauce. Charlynda is an Air Force veteran who took her grandfather’s sauce recipe and turned it into a business. 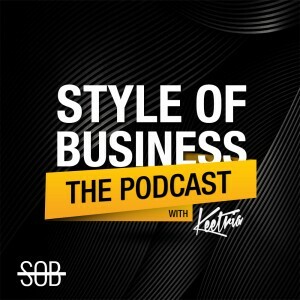 On this episode of SOB (Style of Business), Keetria interviews Charlynda Scales, the CEO of Mutt’s Sauce. Charlynda is an Air Force veteran who took her grandfather’s sauce recipe and turned it into a business. Mutt’s Sauce was created because Charlynda’s grandfather strongly disliked condiments and wanted to create a sauce that could go on anything. Charlynda talks about becoming an unlikely entrepreneur, how she manages her time, what motivates her, and what she’s learned as a business owner. She also gives advice to other aspiring entrepreneurs. Host Keetra introduces Charlynda Scales, CEO of Mutt’s Sauce and former airforce veteran. Charlynda gives a brief introduction of herself. Charlynda grew up in the country with her extended family. Her grandfather came up with a recipe for a sauce because he hated condiments. He wanted to make one sauce for everything and came up with Mutt’s Sauce through trial and error. Final recipe was created in 1956, stayed with the family for years. Charlynda’s grandfather left the Mutt’s Sauce recipe to her. Charlynda turned the recipe into a business. The Mutt’s Sauce business began as a gift to family and friends and grew. It took four months to turn the Mutt’s Sauce recipe into a business. Used org for mentorship as she was a budding startup. org builds you a checklist to get to a final product. Created the product while she was active duty in the military. What makes Mutt’s Sauce stand out? It has a flavor that’s unlike anything anyone’s ever tried. It’s sweet and tangy with a little bit of heat. Not like anything on the market in terms of flavor and consistency. It’s not like mumbo sauce because everyone has a different version of mumbo sauce. The number one question people ask about Mutt’s Sauce is if they can drink it. Someone created a cocktail called The Bloody Mutt. Types of market research for brand positioning and making sure that the products stand out. The BBQ sauce market is flooded, Mutt’s Sauce is a specialty sauce. Lab testing has to be done before you can get into stores. Worked with university labs to test pH and shelf life of the sauce. Safety and preservatives need to be tested. You have to apply to stores to get your product on the shelves. She joined the local chamber of commerce. The chamber of commerce helped her to a launch event. First production was by an Amish family in Wellston, Ohio. 700 bottles were hand poured. Great turnout to the launch event, all 700 bottles were sold. Launch event members connected her to local stores to get Mutt’s Sauce on the shelf. Her first client was a hotel, some farmer’s markets, and some local vendors. What time management looks like. Learned about time management in the military. You need to be efficient and choose your top priorities and be realistic about what can be done. Get your top two critical things done each day. Helpful books on business management and entrepreneurship. The Power of Broke by Daymond John. Charlynda is a VIP ambassador for Daymond John’s new book Rise and Grind coming out next January. Talks about his journey with FUBU. Hear about testimonials from people with humble beginnings. Charlynda wanted to be a doctor, has an interest in anatomy and the human body. Never aspired to own a company but likes to work with people. Naturally inquisitive about how people operate and wants to know what motivates them. Majored in business and got an MBA. What she enjoys most about her entrepreneur journey. The people she’s met and the friends she’s made have made the journey worth it. What are the challenges of entrepreneurship? Not having a partner to help. Entrepreneurship can be lonely and networking can help. Trying to explain to people who aren’t entrepreneurs why you’ve chosen to run a business and make sacrifices. Understanding that the business is bigger than her is what keeps her going each day. She considers herself a servant leader of the people who have made Mutt’s Sauce a part of their lifestyle. The best life advice she’s ever gotten is to believe in something bigger than herself and stay humble. Advice for aspiring entrepreneurs: If you’re thinking about doing something, there’s a reason why they’re having that thought and it’s tied to a purpose. Just have faith, do it and realize it’s not as scary as you thought.